I made 40 small zippered bags before Christmas. During the holiday season I gave most of them away. Two days ago I went to my bag stash to pick out one to give a friend and realized I was down to just four bags. Time to make more! Yesterday, I bought three half-meter pieces of bright fabric, raided my quilting fabric for a length I didn’t like any more to use as lining, cut batting from a large piece left over from a recent quilt, cut lengths of zipper tape, and 2 1/2″ pieces of grosgrain ribbon for a small tab on the side. An hour later I was set to go into business. This morning I went into production – three hours later I had eighteen 6″ x 8″ bright zippered bags. 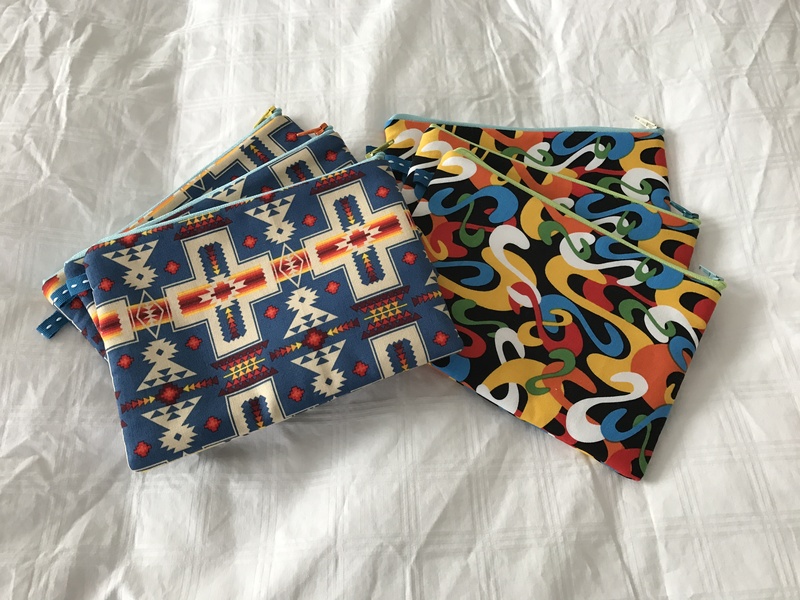 I’m getting organized at this mass production thing – I resisted the temptation to do all the steps on individual bags; I completed each production step on all eighteen bags before moving on to the next. The whole job went quickly. 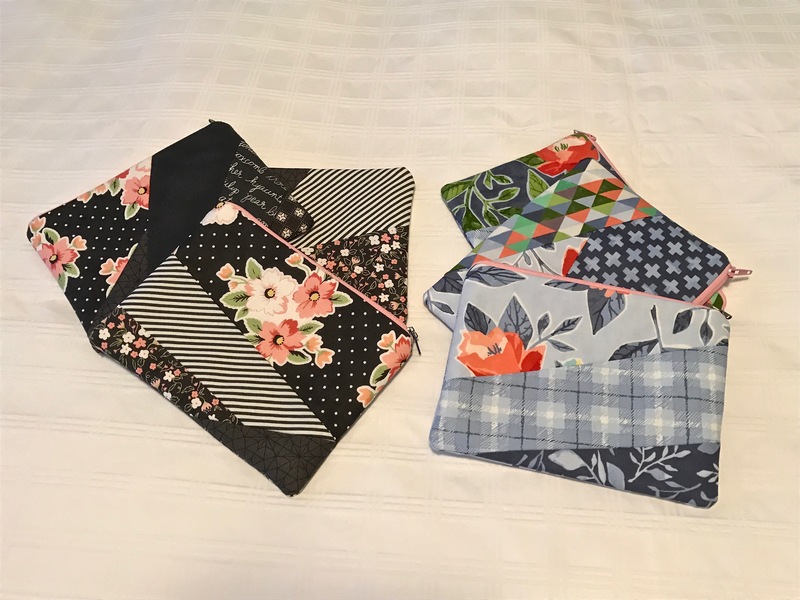 However most of my sewing/quilting is focused on unique constructions so what I’ve learned from bag production line isn’t much help for the other sewing I do. Didn’t take long to make. A trip to my scrap boxes for some small Asian fabric leftovers. Some batting and lining and zippers. Putting it all together went quickly as well. Now to get it in the mail – just not today! We’re being advised to stay at home, it’s obvious why. 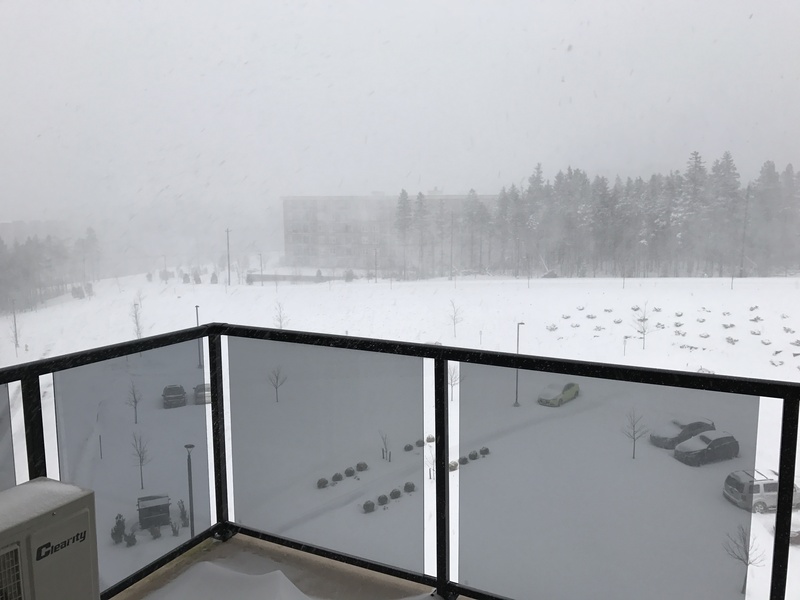 I’m not budging from the apartment! 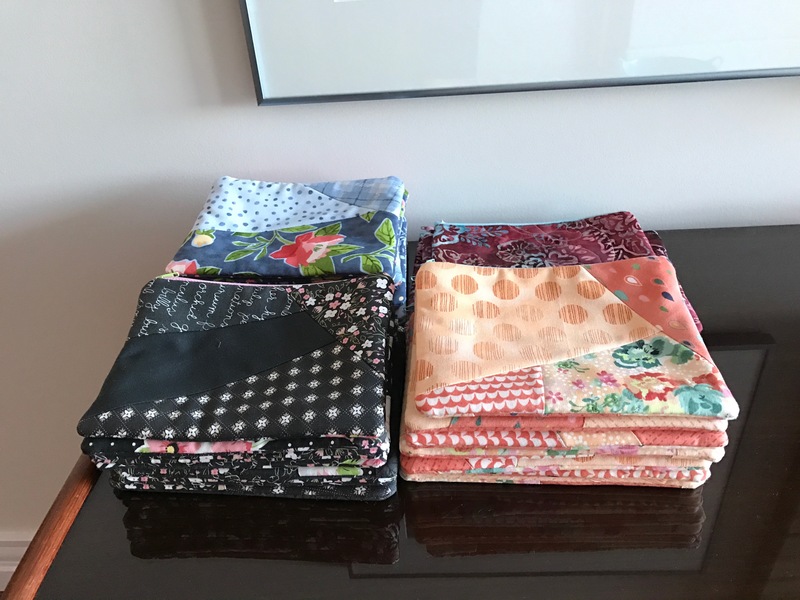 I started with two fabric collections like the one below – samples from fabric suppliers – I had three sets on hand from the day-long quilting workshop I attended a couple of weeks ago. 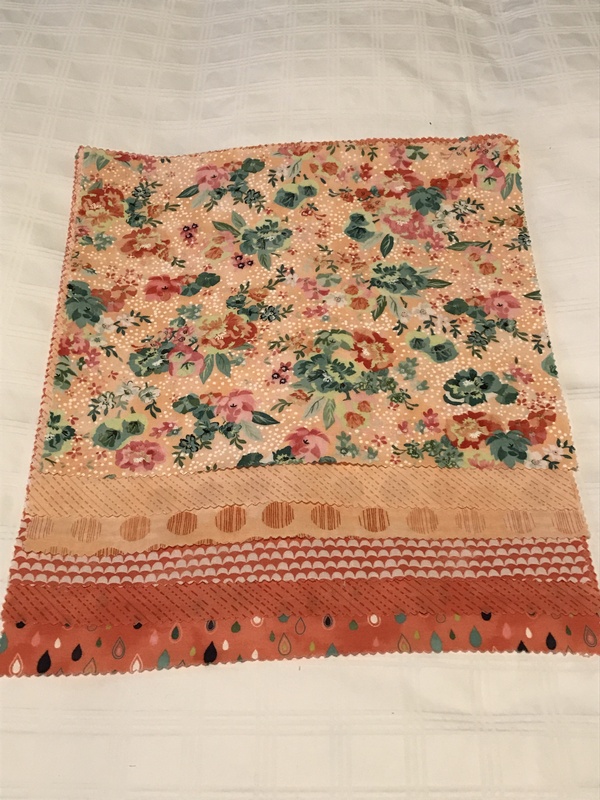 There isn’t enough fabric to make much of anything – maybe a pieced place mat, sometimes a small table runner. But there is enough to make a bunch of bags. I laid each fabric collection on my cutting table, used my ruler and rotary cutter to divide each collection into 4-6 triangular / quadrilateral shapes – enough to mix and match using a stitch and flip technique. Next I cut out thirty (15 x 2 for front and back of a bag) pieces of batting (from leftover pieces) 6″ x 8″. I also cut out thirty pieces of lining fabric from my leftover stash (same dimensions) in preparation for the bags. 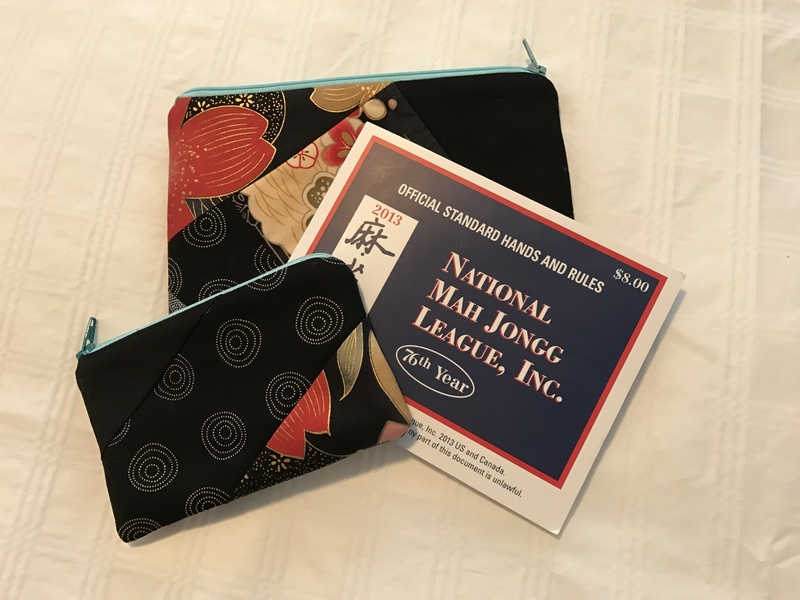 The last bit of set-up was to create 15 zippers from some zipper tape I had on hand, adding slides and cutting the zippers two inches longer than the bag width – in this case 10″ (I also stitched both ends across the tape to prevent the slides coming off while making the bags!). 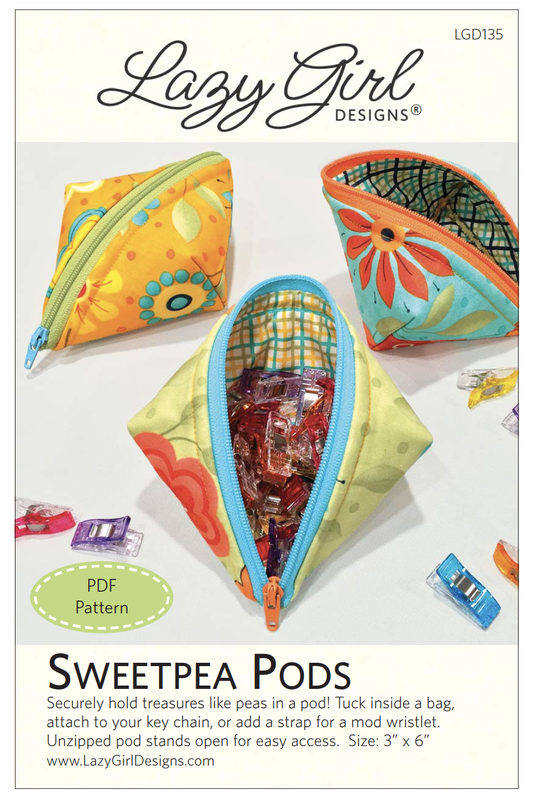 Tip #1: It’s very helpful to use a zipper 2″-3″ longer than your bag – that way you can position the slide to one end, let it hang beyond the bag edges while attaching the zipper – no worry about hitting the zipper slide with your needle or having to veer around it while you’re sewing! Tip #2: Take a piece of batting and cover the surface by laying down a piece of cut fabric, place a second piece at one edge right sides together, stitch and flip, and press open. Keep adding pieces of fabric until the batting surface is covered. Press and trim to the size of the precut batting. Because my batting pieces were relatively small, to took me about an hour and a half to do all thirty pieces (two sides for each of 15 bags, right?). 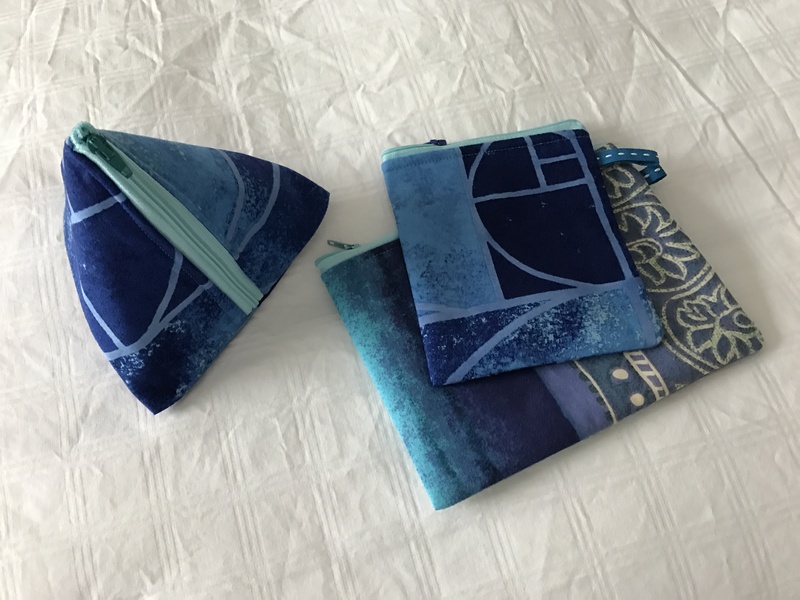 Working in production mode, I matched up two sides, two lining pieces, and a zipper and stacked all 15 bags beside my machine and began assembling the bags. 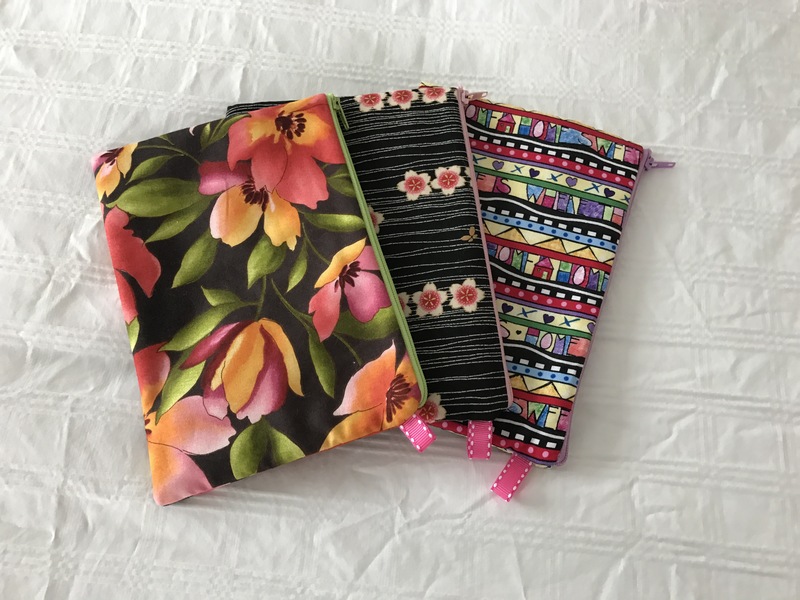 I’m not going to give detailed instructions about making the bags, there are lots of helpful bag-making tutorials around but let me say one thing – lots of people bind the ends of their zipper, I don’t bother with the extra work. I find my zipper is fine incorporated in the bag side seams, but I will mention a couple of techniques that will make the bag-making go smoothly. Tip #3: You’ve got one side of your zipper attached to one piece of the outside (fabric/batting) – align your lining piece face down on the zipper tape (not the batting side), making sure the sides are matching up with the sides of the fabric. Now add the second side of the zipper to the second side of the bag – and again place lining face down on zipper tape, sew. You can see I do two seams to attach each side of the zipper – first sewing it to the main fabric, then stitching a second time to add the lining. A little more work, but it makes it much easier to attach the zipper within the seam. I find something always moves out of position when I try sewing main fabric, zipper, and lining in a single pass. 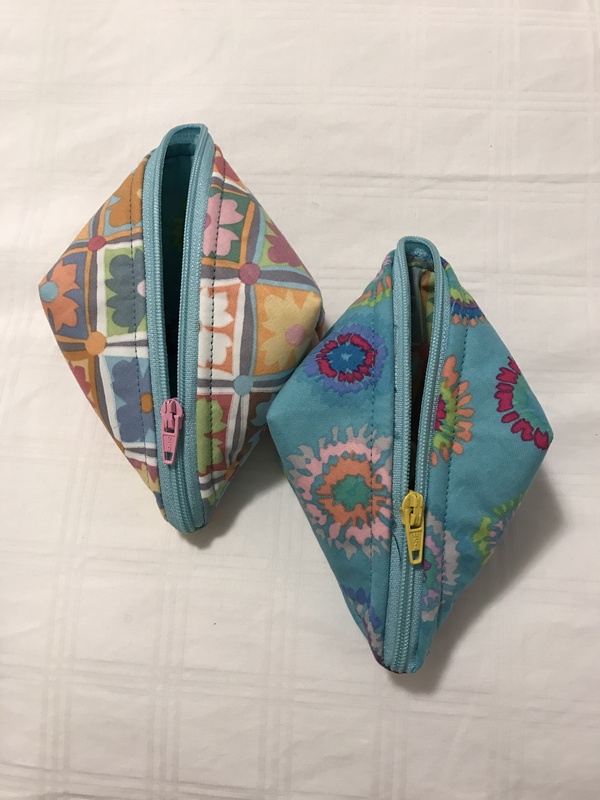 Tip #4: Start by sewing the side with the closed/back end of the zipper, starting at the lining (the slide is at the opposite side), stitch toward the zipper, folding the zipper down toward the fabric/batting pieces, stitch carefully over the zipper, finish seaming the fabric/batting. When everything is finished and you turn the bag right-side out, the zipper will be beyond the fabric/batting, not tucked inside. Now I sew the second side seam, again starting with the two pieces of lining right sides together, past the folded zipper which is pushed down toward the fabric/batting (zipper seams are up toward the lining), and on to the fabric/batting pieces. Now you have both sides stitched. Next seam is along the bottom of the fabric/batting outside of the bag (remember, you’ve already opened the zipper before you sewed the second side so you can get into the bag later). Finally I sew a little distance in from each side along the bottom of the lining to form corners when I turn the whole bag right-side out – this lets me fold in the seam allowance easily so I can top stitch a needle width from the bottom edge of the lining before pushing it into the bag. 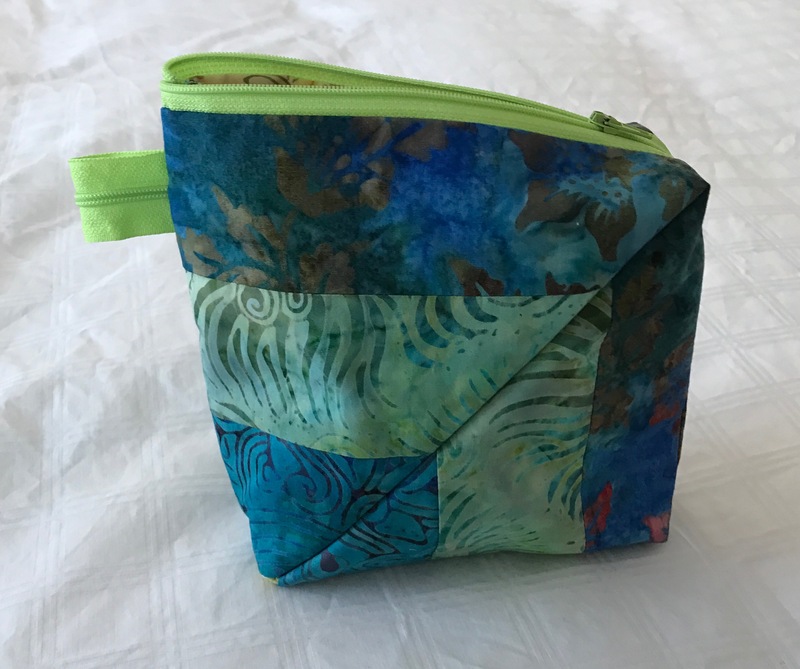 Tip #6: I use a 1/4″ seam allowance on the outside (fabric/batting) portions of the bag, but I use a 5/8″ allowance at the bottom of the lining – the bag itself is bulky and this makes the lining just that much smaller to fit inside the bag without a lot of bulk. Carefully reach inside the opening in the bottom seam of the lining, pull the fabric/batting through (remember, your zipper was opened after you sewed the first side seam!). Push out the bottom corners of the bag, as well as the end of the zipper where the slide is currently sitting, close the zipper, press the bag. And I’ve got 15 new gift bags in my stash ready to give away!